The easiest photo collage processing tool! Picture Collage Maker is an extremely easy-to-use picture collage software that you can use to create entertaining picture collage with your digital pictures or photos.You can select a favorite picture as background, arrange multiple pictures and photos on the paper, then apply operations to them, such as rotating, resizing, changing position, and changing overlay order, apply unique border and mask effects and merge photos seamlessly.In addition to building collage wallpaper, it allows you to program a list of collages to use as your desktop's wallpaper slideshow.The software suite includes two different programs: Picture Collage Maker, Wallpaper Slideshow. It supports popular photo formats such as BMP, JPG, GIF, PNG, TGA, TIF...and is operable under Windows XP, Windows Vista and Windows 2000. In addition, it is quite an easy tool. You could make beautiful picture collage in one minute and what you need to do is just to click mouse for few times. Picture Collage Maker is a pictues and photos collage software that you can use to create cool photo collage with your digital pictures and photos. Creating stunning picture collage has never been easier! Just select your photos and drop them in this tool, add a custom mask,choose from over 10 templates, save as jpg file set wallpaper,and make wallpaper slideshow. • Easy to Use - Extremely easy to use. No Experience Or Computer Skills Necessary! • Create Collage - Allows you to create a mixed–image collage page by compiling various pictures of any size; then you can overlay, arrange, adjust and configure the images to match your taste. • Photo Collage Wizard - Offers a way to create a photo collage automatically, with selected photos and a single click of a button. • Real-Time Editing - Allows you to see your collage changes immediately, without saving and reopening the file. 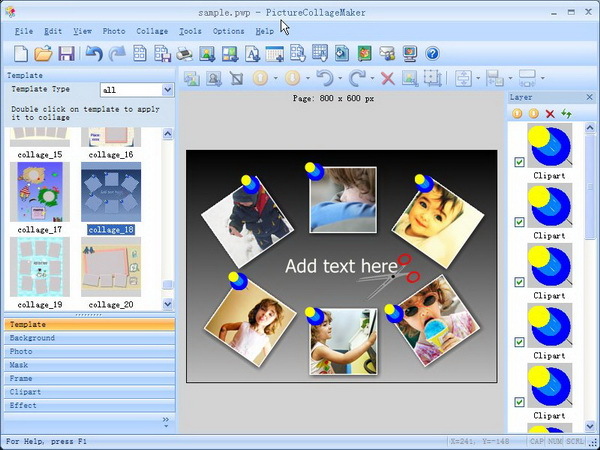 • Default Templates - A large number of predefined layout designs or templates contained within Picture Collage Maker. You can use either preset templates or create your own page layouts. • Frames and Boarders - Included. A large number of borders and frames are available in the collage program. • Backgrounds - Included. A large number of backgrounds are available in the collage program. • Clip Art - Included. 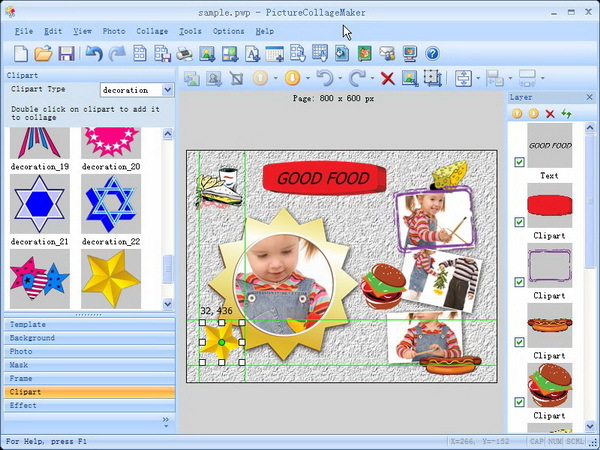 A large number of cliparts are available in the collage program. • Photo Masks - Included. A large number of masks are available in the collage program. • Download Additional Clipart, Backgrounds, Masks and Frames - Offers additional collage resources online. • Layers - One image can overlap others on a collage page; you choose the order in which to layer the images by moving a selected layer to the back or to the front. You can delete layers you don’t like and replace them with new images. • On Screen Text Entry - Opens a text box on your photo collage project. You can resize and move the text to a precise location on your collage page. • Editable Text - Allows you to make changes to collage text, such as font style, size and color. • Move,Rotate, Resize, Flip Images - Move,Rotates, resizes and flips images inside a frame. • Photo Cropping - Allows you to trim away areas of your collage photo. • Move Frames - On a collage project template page, you can rearrange the pre–set frame display. • Delete Frames - Erase a frame from your collage resource files. • Stretch Frame to Fit Page - Decrease or increase frame size so it fits the collage project. • Filters and Photo Effects - Advanced photo editing tools allow you to stylize the look of collage images through the use various filters, such as a grayscale filter, sharpen filter, and a blur filter. • Light & Color Managemanet - Allows you to edit image light and color. Picture Collage Maker give you nearly as much control as offered in basic photo editing software packages. • Multiple Undos - Allows you to undo several recent collage changes as a group. • Send Photo via Email - Send your collage projects to others through email. • Print - Print your collage project. • Save Collage as Single Picture - Save your collage project as a single picture. • Set as Wallpaper - Set your finished collage page as desktop wallpaper or Wallpaper Slideshow. Microsoft® Windows 98/Me/NT4/2000/XP/2003 Server/VISTA compatible.